It was The Legal Genealogist‘s honor and privilege to be a keynote speaker this morning at the fourth annual RootsTech, that massive gathering of genealogists in Salt Lake City that brings so many people together to share, study and learn about family history. Without a real effort to pass down our family stories purposely and accurately, the richness and depth they add to our family history can be lost in just three generations. From grandparent to child to grandchild. That’s just three generations. Things that were absolutely critical in the lives of our own great grandparents — even our own grandparents — could be utterly unknown to us today. From us to our own children to our own grandchildren. And even the small trials and treasures of our own daily lives could be lost to our own descendants… in just three generations. I won’t repeat here the six questions I asked at the start of today’s keynote. 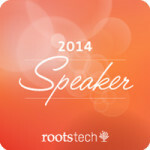 I’m told the keynote will be available online from RootsTech in the near future. I hope you’ll take a moment to tune in to the many features FamilySearch is making available from the RootsTech conference. But I will tell you this: they’re questions I couldn’t answer about my own family. Questions about little things that I so wish I could know about my parents, my grandparents, my great grandparents. So what do we do about this? How do we avoid the terrible loss of our own family’s oral history? Aaron Holt told us: we need to purposely and accurately pass down the stories from generation to generation. 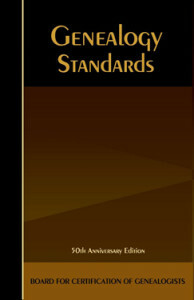 Available through the BCG website, Genealogy Standards is a guide to doing genealogy right. These standards — these best practices for our field — are not for board-certified genealogists alone. They’re not just for professionals who work for clients. They’re for us all, as we try to purposely and accurately identify the relationships in our family history and pass down the stories of our family members. They help us understand what we need to do to capture the information, to ensure that it’s right, and to transmit it down the generations so it won’t be lost. So as I did with the RootsTech attendees this morning, let me do with us all with these words: I challenge us all to apply our Genealogy Standards to our own work and to our own family stories. Let’s purposely and accurately pass down our family stories from generation to generation. And, in that way, make sure that our own family history isn’t lost, in just three generations. Thanks for the synopsis – I’ve read SO many great things about your talk and I can’t wait to get home from work so I can watch it. It was a honnor to see you this morning during the Keynote Session. It was an amazing subject but so true! I sat down at the second question, I failed my pass down to my kids. I know what I have to do when I go back home! Thanks for the kind words, Herve! Thanks for the wonderful keynote presentation! I was there and I loved it! Your presentation was one of the highlights of the conference! Thanks so much, Michelle. It’s kind of you to say so! This is so true. A number of years ago one of my first cousins arrived at a family reunion with a copy of a two page article she had found in a 70-80 year old book. It described 150 years of our family history, as it was known to our great-grandfather. We knew he was our great-grandfather because the article named all of his children (immediately recognizable to us as our grandfather and all of his brothers and sisters, the last of whom had passed away several years before our reunion). I suddenly realized that most of the surviving grandchildren and great-grandchildren of this man were assembled in the room that day, but unless someone set about bringing the family history down to date, we might be the last of his descendants ever to be able to recognize our connection to him. That was how I got started on the great genealogy adventure — to make sure our children and grandchildren didn’t lose this key to their heritage. Good for you for seeing what needs to be done — and for following up! Your keynote was everything a keynote should be…inspiring, educational and motivating. Thank you! My question is a bit more basic. I have struggled with formatting my citations for my blog. I notice that yours always look, well perfect. I have tried word (blog and doc formats) and Windows Live Writer but both lose some of the formatting when I upload or copy to my blog, hosted on Blogger. Would you mind sharing what platform you use to formulate your posts? Thanks for the kind words, Jennifer! I use a very simple footnote plug in for WordPress, called FD Footnotes. I don’t know of a similar feature for Blogger, but I’ll bet the Blogger user community would know! I loved your keynote Judy. I love how you share your knowledge by weaving stories throughout your presentation. (We sure benefit from your Scotch Irish heritage!). I realized that I am so focused on my more distant ancestors, I have neglected to collect and record the details of some of the older generation still living. Thanks so very much for your kind words, Michelle. We all have the same issue with not remembering to get our own immediate family stories captured. I hope this serves as a wake-up call!! Judy – I found your site via Amy Crow. What an eye-opening message! I’m going to follow up by seeking out and viewing your keynote address. Then I have a feeling I’ll be making great strides toward preserving current as well as past family history. Welcome, and thanks for the kind words, Cindy. I attended your Roots Tech presentation back in 2014 and have been searching my notes or the questions that you asked in reference to stories disappearing in 3 generations. Could you email them to me or point me in the direction where I could find them? Thanks! I have asked the RootsTech organizers for the link to the video and will pass it along once they send it. Of course, you’ll wish to come up with your own questions and not simply quote these. Thanks I tried to find it on line but wasn’t able to.